A group of 16 Russian and Norwegian researchers who sailed to take measurements surrounding a Russian nuclear submarine that was scuttled for nuclear waste off the coast of the former Soviet nuclear test archipelago Novaya Zemlya in the Kara Sea have found no radioactive leaks, Norwegian radiation authorities said today. Per Strand, a director at the Norwegian Radiation Protection agency told Bellona, however, that the primary purpose of the expedition, which returned today, was to inspect the possibility of an uncontrolled chain reaction aboard the K-27 Russian nuclear submarine, which was sunk in 50 meters of water in Novaya Zemlya’s Stepovogo Bay in the Kara Sea as nuclear waste in 1981. “The Russian side indicated there might be a hypothetical possibility that spent nuclear fuel in the reactor in extreme situations could cause an uncontrolled chain reaction, which can lead to heat and radioactivity releases,” Strand said in a telephone interview from Kirkeness. The K-27, was dumped by the Soviet Navy in 1981, with spent nuclear fuel packed in its reactors, after a 1968 reactor leak aboard the killed nine sailors. The navy tried to repair it before deciding to seal the nuclear units and sinking the sub. The researchers also examined some 2000 containers of various kinds of radioactive waste that were dumped in Stepovogo Bay, but found no increase in radiation since the site was last inspected in 1994. In fact, according to Hilde Elise Heldal, levels of cesium-137 are slightly lower than they were the last time they were measured 18 years ago, but are still higher than background radiation, she told th Barents Observer. “We measured less than 5 Becquerel per kilogram of Cesium-137 in the sediments near the submarine,”she said. Authorities in Russia and their counterparts in Norway, which lies about 965 kilometers to the west of the sunken sub, need to make a decision about a safe disposal of the K-27, which was the top priority of the expedition, Strand said. Strand said that the joint research team aboard the Ivan Petrov research vessel took sediment, plant and sea life samples. They also used a mini submarine to take photos of the K-27’s condition. Though emphasizing that all data collected is preliminary, Strand said it would “contribute to making decisions about whether the submarine needs to be lifted out of the water” for safer storage. No experts that could assess the feasibility of lifting the vessel were along on the expedition. “For now, the first priority will be the development of environmental impact studies based on the information we have collected to judge the feasibility of lifting the submarine,” he said. Norway’s number one focus for the moment, said Strand, will be developing an effective system of countermeasures should a chain reaction occur aboard the K-27. The dilema for salvage experts at the moment is weather lifing the submarine might not cause jostling, which also could trigger radiation leaks or a chain reaction. The joint expedition – the first of its kind in 18 years – was launched after Russian authorities gradually released in August to the NRPA a catalogue of nuclear waste dumped at sea by Soviet and Russian authorities over a period of decades ending in the early 1990s. Included in the radioactive materials dumped into the Kara Sea were 19 ships containing radioactive waste; 14 nuclear reactors, including five that still contain spent nuclear fuel; 735 other pieces of radioactively contaminated heavy machinery; 17,000 containers of radioactive waste, and the K-27 nuclear submarine. But neither Strand nor Bellona’s Igor Kudrik, an expert on Russian Naval nuclear waste issues, believe this is a complete accounting of the waste. Indeed, acknowledged Bellona President Frederic Hauge, a precise accounting from the Russian side could hardly be expected given Russia’s own ignorance of the extent of the dumped radioactive waste. That the expedition focused nearly exclusively on the integrity of the K-27 when there are so many other objects to check, underscores that the concern of a chain reaction aboard the scuttled submarine is very real, said Kudrik. “The focus on K-27 shows that the concern for the possibility of chain reaction developing in the reactors of the submarine is well-founded,” he said. 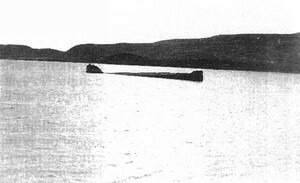 The K-27 was the only sub of its class ever produced by the Soviet Navy, and was powered by two lead and bismuth cooled reactoers, which solidified when the reactors were switched of. This presents special difficulties for removing the highly enriched uranium fuel within the, as the fuel rods are now apart of the metal of the reactor itself, which means they cannot be removed by conventional means. The perceived advantage to liquid cooled reactors were that they reduced the size of the reactor unit that needed to be placed aboard the submarine. Liquid metal cooled reactors later made their appearance in Soviet project 705 Alfa Class attack subs, the first of which was commisioned in 1971. The last of the seven Alfa Class subs was commissioned in 1981. All Alfas were takne out of service by 1990. Preeminent Russian environmentalists Alexei Yablokov, who published research on radioactive waste near Novaya Zemlya in 1992 as former Russian President Boris Yeltsin’s chief environmental advisor, urged that the submarine be lifted Tuesday. Financing from the French Commissariat for Atomic Energy to provide decommissioning equipment for the liquid metal cooled reactors about the Alfa subs – the K-27s cousins – was installed at the Gremikha former naval base on the eastern portion of the Kola Peninsula. Last year, the last of the Alfa reactor cores was removed and taken away for storage, the Barent’s Observer reported, opening the possibility that the French financed equipment could be used to removed theK-27s damaged core. But anonymous sources at Gremikha warned that time is crucial as the reactor-core removal equipment is ageing, said the paper. Sergei Novikov, a spokesman for the state run nuclear corporation Rosatom, which oversees Russia’s nuclear industry, wasn’t available to comment following calls to his office and mobile phones. Anatoly Zakharchev, the head of the submarine decommissioning unit at Rosatom, was also unavailable for immediate comment. Preliminary analysis presented today suggested the enormous nuclear waste finds should not – in their current condition – impede Arctic oil exploration provided companies steer clear of the shallows surrounding Novaya Zemlya. Norway’s Statoil and Eni SpA of Italy have set up joint ventures with Russian oil giant Rosneft to explore in the Russian area of the Barents Sea, a larger body of water next to the Kara Sea, where the Soviet Union also dumped waste. The partners are targeting about 15 billion and 26 billion barrels of oil and gas resources respectively. Statoil spokesman Bård Petersen told Bellona today in a telephone interview that,” barring any new revelations regarding the radioactive sources, I do not think they will pose difficulties in the progress of our exploratory progress” with Rosneft. He did say, however, that Statoil would monitor the discoveries made by the joint Norwegian-Russian expedition. Bellona’s Kudrik said the financial responsibility for cleaning up the radioactive dump at the bottom of the Kara Sea rests with the Russian government. But he suggested big oil should assist in accelerating the process by lending its offshore expertise. When the NRPA last month received the extensive list of radioactive hazards litering the floor of the Kara Sea, many in Norway viewed the disclosures in the documents as a veiled cry from Russia for international aid. In his remarks to Bellona, the NRPA’s Strand did not rule out the possibility that Norway may again be called upon to provide financial assistance should research based on the results of the expedition show that lifting the K-27 is feasible. Norway has thus far invested some $200 million in Russian nuclear remediation projects. Norwegian Foriegn Minister Torgeir Larsen two weeks ago told the Barents Observer that his ministry was open to providing Russian with “inter-survey and risk assements” associated with lifting the vessel, but consigned that responsibility to the Russian side.